This is the first time I have attended a Birth Expo. I am excited to share my work and some of my products with everyone. I will be attending the Expo with my friend Carolyn from Juniper's Nest. Carolyn and I will both be offering some great discounts as well as a sweet give away! Come to the expo to see the great deals and to sign up for the prizes! Please check out all the details below! It’s the 5th Annual Pregnancy, Birth, and Beyond Expo in Rockford, IL! Previously known as “LABORfest,” this event is open to the public and FREE with a suggested donation. Stop in and browse the many vendor tables full of local birth professionals, businesses, services, and products–all for pregnancy, birth, & beyond. 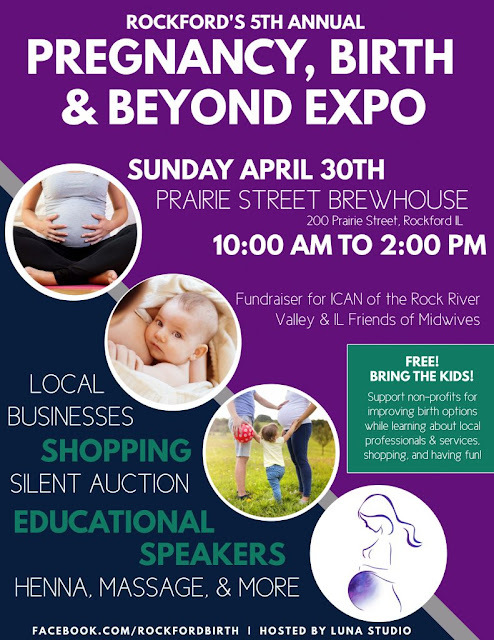 There will be 35+ vendors including doulas, childbirth educators, local shops, handmade goods, chiropractors, massage and physical therapists, photographers, fitness and health specialists, and information on breastfeeding, cloth diapers, cesareans, homebirth, self-care and more. Attend the presentations, do some shopping, meet local professionals, get some henna art, relax with a chair massage, learn about holistic healing, and have fun! All proceeds are donated to local non-profits improving birth in our community, including ICAN of the Rock River Valley (the International Cesarean Awareness Network) and ILFOM (IL Friends of Midwives). Hosted by Luna Studio.